Vancouver, British Columbia--(Newsfile Corp. - December 5, 2018) - Spearmint Resources Inc. (CSE: SPMT) (OTC Pink: SPMTF) (FSE: A2AHL5) (the "Company") is pleased to announce that encouraging preliminary results have been obtained over the north-easterly block of Spearmint's Chibougamau vanadium properties. Continuing airborne (drone) magnetic surveys are being carried out over the western and south-western blocks of the properties as well. Several north-east trending anomalous zones have been detected from the ongoing magnetic survey. The most significant zone to date is a sharply defined area of strong magnetic susceptibility, displaying a steep gradient ranging between - 120 nT to + 135 nT, within a sinuous anomalous area measuring approximately 600 m N-S by 300 to 600 m E-W.
James Nelson, President of Spearmint, stated "We are excited to have uncovered a potential high priority target on our Vanadium prospect. Immediate follow up work is being planned and management is expecting to have crews on the ground shortly to further investigate this specific anomaly. Additionally, the airborne magnetic surveys covering the two Western blocks are expected to be completed in December. As the Vanadium price-per-pound continues to reach all-time highs, recently breaking over $33USD per pound, we are very excited to have uncovered this sharply defined target this early in the phase one work programs on our Chibougamau Vanadium prospects." 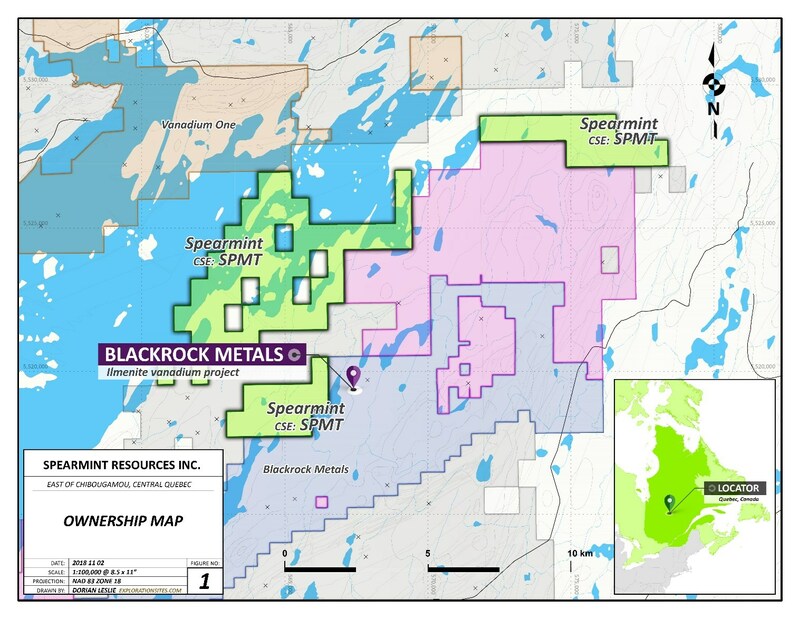 Spearmint's current projects include the 'Chibougamau Vanadium Prospects' comprising of four separate claim blocks totaling 9,735-acres bordering, or in the direct vicinity of the vanadium deposit of BlackRock Metal's (private) Ilmenite vanadium project and Vanadium One Energy Corp. and Spearmint's 'Clayton Valley Lithium Prospects' in Nevada comprising of two claim blocks totaling 800 acres bordering Pure Energy Minerals & Cypress Development Corp.
Spearmint's current projects also include a portfolio of prospects in the Golden Triangle of British Columbia; the 'Golden Triangle Gold Prospects' comprising of six separate claims blocks totalling 9,157 acres bordering GT Gold Corp, the 920 acre 'NEBA West' & 6,803 acre 'NEBA' Gold-Copper Prospects bordering Aben Resources Ltd, the 'Henry' Gold-Copper Prospect consisting of two contiguous claim blocks totalling 1,989 acres in the direct vicinity of Golden Ridge Resources Ltd., and the 21,587 acre 'EL North' Nickel-Copper Prospect is a contiguous land package of six claims in the Eskay Creek Camp bordering Garibaldi Resources Corp. Spearmint's other projects in British Columbia include the 'Gold Mountain Prospects' comprising of three separate claim blocks totalling 1,245 acres bordering Barkerville Gold Mines, Spearmint's 16,662 acre 'WHY WEST' Magnesium project consisting of six claims near Rossland BC, the 'Safari' Copper-Gold Prospect consisting of 9,007 contiguous acres located in the northern Quesnel Trough in North-Central BC directly bordering Serengeti Resources Inc., and the 'Hammernose' Gold Prospect consisting of 5,140 acres directly bordering the strategic alliance between Westhaven Ventures Inc. & Sable Resources Ltd. in the Spences Bridge gold belt located in Southern British Columbia, Canada.